Horses are pretty good. They're a bulky collection of meat and muscle in a light fur wrapper, and, for millennia, our species' fastest mode of transport. But as good as horses are, they can't compete with Warhammer's Demigryphs. That's the beauty of fantasy: a cross between lion and eagle can be a thing of majestic beauty, and not just an unholy and unfortunate travesty of nature. Demigryphs, naturally, will be making an appearance in Creative Assembly's Total War: Warhammer. 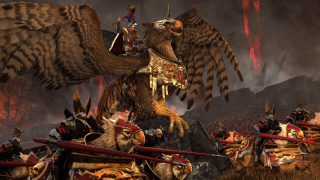 The video above offers a glimpse of the beast, and is the first in a series introducing the units of Total War's first fantasy outing. As mentioned in the video, Creative Assembly will be releasing their first in-engine trailer this Friday. That's "in-engine," not "in-game"—but will nevertheless be our first tangible taste of Total Warhammer since its announcement.